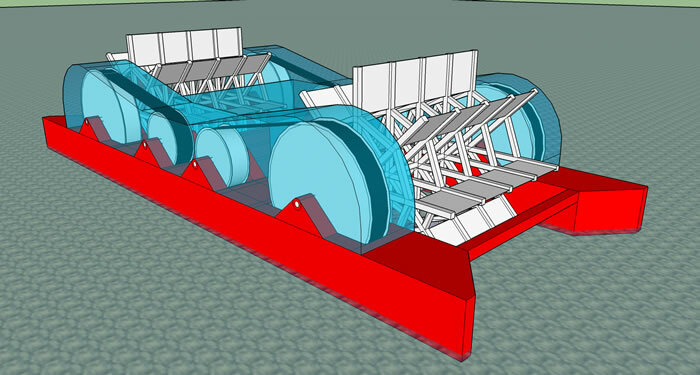 One Open Ocean Current Catcher Frames© can support approximately 24 or more marine current generators with 16 meter OD blades with a total power output of approximately 15 Megawatts in 2.5m/sec flow velocity conditions. Current Catchers© Frames can support fixed generators or current generators that rotate 360 degrees about their vertical axis. The frames can support most types and sizes of generators. The generators chosen will likely be the ones that produce the most power at the lowest cost for the projected surface area of current catcher frame. Generators can be equipped with shrouds to further increase power output / projected area of the frames. Current Catcher© frames are positively buoyant tubular frames, like those used for offshore platforms for over 50 years. Frame corrosion is prevented below water through the use of anodes and/or impressed current and in the splash zone and above the splash zone with the use of special fiberglass reinforced rubber coatings. Normally, no part of the Open Ocean Current Catcher Frames© extends above the water's surface. 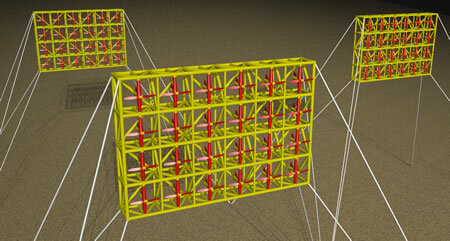 The submerged frames are usually deep enough to avoid normal wave loading and ships. 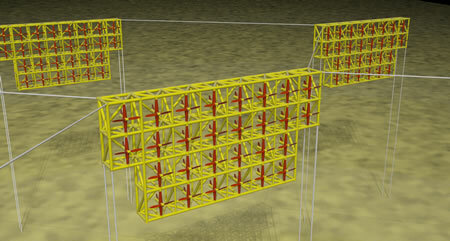 These frames can also support surface wave generators (Wave Catchers©), which in the right locations, can add significant power output to each frame. Wave Catchers© and top buoys can provide additional top tension for the Current Catcher© frames and reduce the frame member sizes to further meet the frame’s buoyancy requirements. Strong currents are often found between two land masses, such as between the Yucatan Peninsula & Cuba, or between Cuba & Florida, and sometimes these locations are also near large population centers minimizing the power transmission losses to these large population centers. Remote areas of high currents can also be used to supply power to all sorts of industrial operations that need significant power but need very few people to run the operation such as: desalination plants, offshore platforms, FPSOs, floating or land based LNG plants, power for the grid, etc. benefit from the fact that the major components already exist like: tested generators, the offshore platform type pipe tubular frames, the mooring systems, etc.